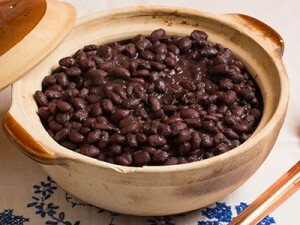 Pressure Cooking Black Beans is so easy, nutritious and very tasty. There’s really not much involved in pressure cooking black beans. It’s really quite simple and easy, and the benefits are enormous! Boiling beans can take up to two and a half hours or so, but pressure cooking black beans shortens that cook time to just 40-minutes and without having to constantly watch it. You do not have to soak dried black beans prior to cooking, whether cooking in a pressure cooker, or otherwise. Actually, they come out tastier when you don’t soak them. Black beans hold their composure better during the cooking process than if you had soaked them first. Black beans cooked straight from dry retain much more of their dark black phytonutrients, in comparison, the pre-soaked beans come out mushier and much paler. What you use as co-ingredients will depend on your tastes and what you have on hand. You may also enhance the flavor of the beans with Ham, Ham Hocks (pork knuckles), sausage, kielbasa, or even sliced pepperoni. What ever sounds good to you. 1. In a 6-quart pressure cooker add the Olive Oil, the Ham and the Onions and set to ‘Brown’. Quickly sear all sides of the meat. This should take about 5-minutes. 2. Add the rest of the ingredients: Garlic, Bay Leaf, Black Beans, Water, Salt, and Pepper. 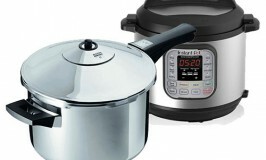 Follow your cookers instructions to install the cover, set the pressure cooker to High, and set the timer to 40 minutes. 3. Remove from heat and let rest for 5 minutes. Release the steam, Again following your cookers instructions, release the pressure and remove the lid. 4. Discard the Bay Leaf. Remove and cut up the Ham and either add back to the beans or leave separate. Season beans to taste (vinegar, etc.). Note: The Olive Oil helps prevent the beans from foaming while cooking. Beans are a excellent source of protein, vitamins, and fiber. They are convenient and versatile. You can have them as a healthy side dish or add them to soups, salads, stews and chili’s to increase nutritional their value and flavor. 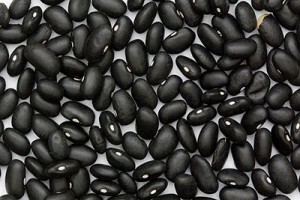 The outside seed coat of the black bean is an outstanding source of phytonutrients, which help prevent disease and keep your body working properly. Black beans provide special support for digestive tract health that is responsible for lowered colon cancer risk. Recent research links bean intake to lower risk of type 2 diabetes, many types of cardiovascular disease, and several types of cancer. American Dietary Guidelines have established 3 cups of cooked legumes per week, or about 1/2 cup serving per day, as a minimum desired amount. 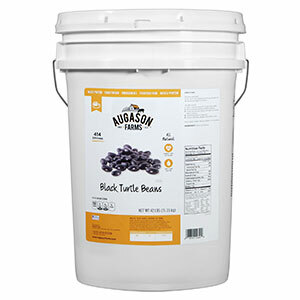 You can buy Dried Black Beans in this 42-pound pail for long-term storage. This is a much more cost-effective way to buy bulk beans. The benefits to buying dried beans, is that you can buy them in bulk and very cheaply too. Dried beans have a long shelf life if you store them in the absence of oxygen and light. Oxygen will lead to rancidity of bean oils and light will quickly fade bean color. 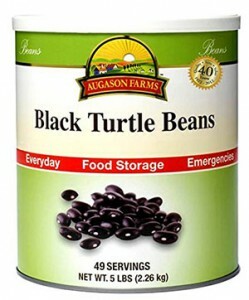 Dried black beans can be purchased in sealed in #10 cans, which will keep the beans fresh for 10 years or more. A much more cost-effective alternative is to buy your beans in bulk from the market and seal them yourself in Mylar food-storage bags, each bag with an oxygen absorption pack thrown in. These sealed bags can also be stored for more than 10 years. Dried beans stored in normal food-grade polyethylene bags with as much air squeezed out of your bags as possible, have a shelf life of 1 year or more. Colder storage temperatures will increase shelf life. When packaged in #10 cans or Mylar-type bags, with the oxygen removed, they have a shelf life of 10 or more years. Is this recipe made with an electric pressure cooker? Or the old one you use on the stove top? Thank you! We love black beans and rice with a pork roast. Also if you have any ideas on how to cook a pork roast in an electric pressure cooker i would be forever grateful.